Santiago Valdez, Benjamin M. Read, and his brother Larkin Gregory Read were business partners, friends and colleagues. They were also linked by marriage. Larkin was married to Teodora Martinez, the daughter of Santiago Valdez. If we are to believe that Santiago Valdez was indeed a son of Padre Martinez, as family oral history strongly asserts, then Larkin’s wife Teodora would have been the Padre’s granddaughter. The brothers Read and Santiago Valdez much later became a team of translators for the Laws of New Mexico: Compiled in 1884. Santiago Valdez, putative son of Padre Antonio José Martinez of Taos, was the main author of the Padre’s 1877 biography, Biografía del Presbítero Antonio José Martínez, Cura de Taos, complied a decade after the death of the priest. The original Spanish manuscript–literally hand-written and partially translated into English–is included in the Ritch Collection at the Huntington Library in Sierra Made adjacent to Los Angeles. In 1993, I did a contemporary English version of the work available from the NM State Archives and UNM library. Mr. Peter Blodgett, Huntington Library manuscript curator at the time, encouraged me to have my version published. In the hopes of having a scholarly edition published, I lent my copy of the manuscript to Fr. Thomas Steele, S.J. accomplished author regarding people and things New Mexican. Together with Vicente Martínez of Taos—a close relative of Valdez– and Mr. Robert Torrez—former NM State Historian and protégé of Fr. Steele—we hoped to publish a scholarly annotated edition of the biography, perhaps bilingual, together with two other key documents relating to cunabula of the Priest of Taos: his 1840 Autobiography written in Durango, and his 1867 Last Will and Testament. In his Last Will and Testament, Padre Martínez named Santiago Valdez as executor and heir of his books and papers. In December of 1868, a year and a half after the Padre’s death, Valdez first began writing in Spanish the biography of the Padre. Benjamin Maurice Read, friend and business partner of Santiago Valdez, did a preliminary translation of the manuscript after Samuel Elliot—related to the earliest efforts of the NM Historical Society—began translating the first twelve pages of the manuscript. On a separate page attached to the Spanish-English manuscript, Larkin Gregory Read– younger brother of Benjamin M. Read noted in his own hand that he had “faithfully copied” the original (Spanish) manuscript in good handwriting, and that his elder brother Benjamin Maurice Read was to further “annotate and amplify” it. Larkin, having married into the Martínez clan through the Padre’s granddaughter, was a good resource for the work of his brother. Valdez completed the work in mid January1877 near the Padre’s birthday, the tenth anniversary of the Padre’s death, and a year after the nation’s first Centennial,. Cecil V. Romero, a relative of Padre Martínez, in 1928—ninety years after Padre Martínez published his autobiography on his own press (Los Méritos del Presbítero Antonio José Martínez, Cura de Taos)–translated it into English for the NM Historical Review. With an eye on that previous translation, Father Tom Steele, S.J. this shorter version of this autobiography from a copy of the original that Padre Martínez wrote in 1840, and presented to his ecclesiastical superiors in Durango. On October 21, 2009, Father Steele–with help from Vicente Martinez, Robert Torrez and myself–finished the translation. Father Tom was pleased with my editing the biography into final form. It was intended to be the first part of a three-part scholarly work in English complemented with other key primary documents: the 1877 Biography of Padre Martínez by Santiago Valdez (for which I was principal agent), and the Padre’s Last Will and Testament (for which Vicente Martinez of Taos, closely related to the Padre, was principal agent). Padre Martínez edited his Will within a month before he died in July 1867. Elena Nápoles Goldfeder, a Cuban American with a doctorate in Spanish literature, greatly helped in the translation of various works pertaining to the Cura de Taos, including his 1840 autobiography. Father Steele was to be editor of the total project of the TRILOGY, but when his health began to fail, he asked his former student Robert Torrez–former historian for the state of NM–to continue in the role of editor. The 1840 abbreviated autobiography presented to his superiors in Durango during his year of sabbatical–as well as his original 1837 autobiography under the title Méritos del Presbítero Antonio José Martínez, Cura de Taos (published on his press in 1838)– is incomplete on several accounts. • Padre Martínez does not mention his legitimate wife who died in childbirth before he went to the seminary. • Neither does it make reference to his housekeeper by whom he also had children. • Since the autobiography was edited and completed by 1840, it necessarily does not deal with the Padre’s contentious relationship with his Bishop Jean Baptiste Lamy who arrived in New Mexico in 1851, five years after it became part of the United States. However, the autobiography does clarify many aspects and details of the life of the Padre heretofore unknown or misunderstood. In a letter to Vicente Martínez, Father Steel gave his imprimatur–expressing his approval of the final touches I gave to our collective translation of the 1840 Autobiography of the Padre. In homage to Jesuit priest Father Thomas Steele, a superior scholar on things New Mexican, a mentor and collaborator, I publish this work on my website, The Taos Connection, on March 25, 2015, the feast of the Annunciation. He is now in his forty-eighth year. On March 10, 1817 when he was in his twenty-fifth year, he began his studies in the Tridentine Seminary of Durango as a boarding student, beginning from the study of Latin grammar, until March 9, 1820. On that day, he was granted gratis a Royal Scholarship in preference to others (see Document #2). He enjoyed the benefice until January 1823 when, with his superiors’ permission, he left the school and returned to this Departamento and to the home of his parents. The total time of his studies in the college was five years, ten months, and a few days. During his time, he studied Latin grammar and Spanish rhetoric, and in these subjects he held first place among all the rest of his fellow students. (See Document #3) In compliance of the request of Bishop Castañiza, he lodged with him. A particular certificate of equal value to First Place in (Spanish) Rhetoric, since that served as the foundation for advancement of someone who had studied all grammar courses, would have been a certificate for the study and mastery of Latin grammar. However, that remained in the file of one of his petitions for Holy Orders at the diocesan office. He studied philosophy  beginning with four questions about Certitude, Logic, Ontology, and the Metaphysics of Reality from its author the Abbe [Francois] Para [du Phanjas]. Father Altieri’s books covered Arithmetic, Algebra, Geometry, and General Physics. At the end of the course, he was given the Supralocus, recognition of first place above all of his fellow students (as attested by Document #4). Finally, in the College, he studied the whole manual of Moral Theology, fourth edition, by the author Francisco Larraga, with examples by Grosin; he also studied The Sacred Ceremonies by the rubricist Galindo, supplementing his understanding by reading other authors. No professor explained these last two subjects because he studied them privately while taking the regular scholastic course. The first time around when he was a student in Durango, he earned certificates of the highest standing from the examinations that he underwent; according to the original certificates given him, he passed the courses for the exercise of the ministry with complete comprehension. Besides completing his studies and making a very detailed and thorough review of everything that he completed in school, he finally completed–at the house of his parents that was also his own–the author Gotti’s Scholastic Theology from his forty treatises in its three tomes as well as Murillo Velarde’s Scholastic-Dogmatic Theology from its hundreds of treatises contained in the ponderous tomes. Almost as soon as he had begun college, in preference to any other of his classmates, he was made responsible for keeping  the classrooms in order, and he also took turns teaching in his respective classes. In 1819, the Rector placed him in charge of the expenses for kitchen and costs for repair of schoolrooms. He took care of the brickwork and the whitewashing, mending the stairs and fixing the doors, and he was also responsible for the younger boys’ clothing, keeping them in order and seeing that they attended the ceremonies at the Cathedral. In regards to housekeeping, he held the keys to the pantry and avoided abuses; he secured the back or side gate when the shepherd took the sheep out each dawn and brought them back each evening. In the year 1821, he took care of all his schoolmates in the college and became the sub-minister. He discharged this duty to the complete satisfaction of his superiors, along with the others noted above until January 1823. He then gathered these certificates and various others, and left the college. (As shown in Document #6 mentioned above)  Regarding the evidence of Document #7, in 1822 he had the choice of saying the weekday Masses [taking turns with] with the priest-professors in the College, or of being the Chaplain to the College with the faculty [license/permission] of hearing Confessions on Saturdays for those who had to obey that precept and receive Communion. He also participated in the care of the Sagrario of the Parish, but unfortunately, he failed to obtain a certificate. He left college one year short of finishing his course in Scholastic Theology because he fell sick of an ailment that impeded his breathing. When he had recovered from it at his parents’ home, he asked for time to exercise his ministry. He was granted this as shown in Document #9. Concerning his services in this period, he said Mass, preached, heard Confessions, and attended to the sick while he being very faithful and prompt in charity as need and situation required. His sound conduct in religion and among the town’s society appears in Documents ##10 and 11 that originate from the Town Council of Taos. Document #12 comes from the Alcalde of Tomé, where he helped in priestly ministry from November 24, 1823 to March 20, 1824 (AHAD 253f088). He had the approval of the  Chancellor of the Diocese, as seen in Document #13, since he himself had especially recommended his taking that post. In 1826, he took over the administration of Santo Tomas de Abiquiú parish, as is attested in Document #14. He most carefully served the parish as regards the administration of the Holy Sacraments, preaching on the Gospel on feast days, conducting himself among the faithful of the parish and among the authorities with the greatest harmony, affection, and proper manners—aiding the poor with alms, and not burdening the poor with the aranceles if he found that he could get along without them. He continued until September of that year  when he resigned from that parish as shown by Document #15. His resignation [from Abiquiú] came about because he was at that time [also] serving the parish of Taos that Vicar [Fernandez San Vicente], mentioned above, had put into his care (by virtue of Document #16) from July 23, 1826 to the present . Vicar Fernandez San Vicente visited the parishes in the year 1826 , as well as the chapels of Taos and Abiquiú during August. In August 1830 [four years later], Vicar Don Juan Rafael Rascon visited the [Pueblo] Parish and the Chapel of [Fernando de] Taos [i.e., Our Lady of Guadalupe]. In July 1833, the present Bishop, the Most Reverend Don José Antonio Laureano de Zubiría, visited the same parish and its chapels. He approved of his fulfillment of ministry in all the matrimonial diligencias [Pre-Marriage Investigations], and of the decisions copied into the entries of all the (parish) books— all comparing quite favorably with the fulfillment of ministry by his predecessors, and even comparing with other parishes that he [Bishop Laureano Zubiría] had visited. In checking entries in those books, each (reverend) visitor specifically stated in very particular terms that he [the parish visitor] congratulated him [Padre Martinez] and encouraged him to continue in the same manner, as attested by Document #17, a certification of the entries on the occasion of a Holy Visitation as stated above. Together with the Parish of Taos, he has also managed the mission of San Lorenzo de Picuris first by order of Vicar Don Juan Rafael Rascón from March 1829 to April 1831. Then he resigned for  adequate cause, and the resignation was accepted as stated in Document #18. He managed the mission of San Lorenzo de Picuris for a second time from November, or more precisely from October 25 1833, until the present. He has held all of these duties as Acting Pastor by order of the present Bishop as indicated in Document #19, and has fulfilled all of them as best he could. He learned that being unable to attend the competition [in order to be considered for an appointment as pastor] did not lower his reputation insofar as the secretary of the Church [Diocesan] Council  makes clear as shown on this point by Document #20. He has been, and still is, delegated as the minister of the Tertiaries of Saint Francis of the Order of Penance [Penitentes] among the devout parishioners of Taos, as attested by Document #24 of the Father Custodian. From 1833 to the present, he has had the delegation of administering Confirmation in this parish [of Taos] and in the mission of Picuris, a faculty he has exercised as shown by the certified entries in the proper parish register, and Document #25 states his authority of confirming and functioning as [but not yet officially appointed as] the Pastor of Taos. In politics, he has been elected first to the office of Territorial Deputy, a post that he discharged in the Capital of Santa Fe during 1830 and 1831, and  he has attended the Departmental [legislative] Council as Deputy whenever it met up until the present, contributing toward the expense of paying for a secretary. He has also contributed a certain amount of money to the services of the state that the Honorable Deputy Vicar Don Juan Felipe Ortiz assigned to him for travel expenses, and he has contributed another equal amount for the Texan emergencies as shown in Documents #26 and #27 given him by the same Vicar Ortiz. He contributed for the relief of the troops used in quelling public disorder in this Departamento last year as Document #28 attests. Lieutenant Don José Silva gave him a receipt, and there were small amounts he refrains from mentioning. During the disorderly uprisings of last year [1837?] and even as this statement is being written [Padre Martinez seems to be quoting from his original autobiography written in 1837 and published on his press in 1838, but without updating this part and subsequent parts for the shorter revision of 1840], he has been persecuted because of the advice, persuasion, and inducement by which he expressed his opinion about leading the wayward back along the right path. However, he finally convinced them to listen to him, settling the disturbance, and to a greater  or less degree preventing various impending problems from deteriorating from bad to worse. He was in Santa Fe, the capital, when the conspiracy formed in the Villa de la Cañada [Chimayó] in January of this year  when the war broke out at the pass of Pojoaque … He offered to go as a [military] chaplain, and His Excellency the Governor Don Manuel Armijo accepted. He then went with his Excellency [Armijo] and his troops, served, and presented himself as a brave and charitable soul, confessing the wounded and others who died during that episode. He discharged his duties with the bullets whistling close over his head, surrounded by the other horrible machines of war, and once being only five yards away from such a place where he had just heard a wounded man’s confession. The campaign was conducted with greater precaution, and it withstood the mob of rebels largely due to his efforts, and to the timely news that he sent His Excellency the Governor. The expedition was well planned and well timed, and it avoided many of the rebels. After that uprising, he continued this service as military chaplain, quelling other rebellions that threatened, continuing even until very recent days. His first communications were some letters  of exhortation he left after going to Santa Fe, directing a supply of weapons to Taos to comply with the order, and thus he brought order out of disorder. Because of that move by which he immediately sent the news of the victory of the national forces, the rebels did not leave Taos. Quiet ensued, as verified by Document #29 of Don Juan Antonio Aragon, the Alcalde of Taos, and by Documents ##30 and 31, letters from His Excellency, the abovementioned Governor that verified other points. After some young men inquired, he mentioned to the visiting Bishop  their desire to study for the priesthood. After the Bishop heard his request, he granted his permission to immerse the young men in Latin grammar and everything else he could provide them, and under this permission, the young men were put under his direction. He began on July 15, 1833: three joined in November of the same year, and another three more joined a year later in November 1834. All of them started from the beginning of grammar (the declension of nouns), and they didn’t even have books. The result was that by August 1836, they were ready to go to Durango, and so they did because they had already learned Latin grammar and moral theology. Of those approved, six of them eventually received Holy Orders [as of 1840 and were placed] in charge of administering Holy Sacraments in the Departamento of New Mexico. The names of those three who left Taos for Durango in early 1836, and were ordained in 1839 are the following: Don Juan de Jesus Trujillo, Don Eulogio Valdes, and Don Mariano de Jesus Lucero. Of the rest, five came to this ecclesiastical capital of Durango at the end of 1836 with grammar studies and some moral theology. Their names are Don Tomas Abeyta, don Jose de Jesus Lujan, don Jose Manuel Gallegos, and don Eusebio Barela. Don Antonio de Jesus Salazar received [only] minor orders because illness prevented him from constant study; however, once his health was restored, he studied Moral Theology that year under the same supervision and now has presented himself to receive Holy Orders. In regards to the last two to enter the program, he instructed them very well for two years in Latin Grammar, parts of Philosophy, Real Metaphysics, Arithmetic, Geometry, and General Physics. One of the pupils died of fever. The other, don José de la Cruz Vigil, studied some Moral Theology, and on scholarship entered the College at the time with the goal of continuing his studies in Moral Theology in the hopes of receiving Holy Orders and thus become a priest. Besides all the men mentioned above, he has modified the curriculum of Latin Grammar from two years to three, and then admitted other young men, although not all of them started at the beginning. He took their admission without charge, both the first group and the second, and instead provided them with free notebooks taken from those who already had those subjects. He kept two orphans in his house who had no means of support, one of them coming from the first group and the other from the second. He fully paid all the conciliar pensions for the Curato. In his residence, he hosted the Procurator of the Departamento who helped verify the payments to the Rector of the College. At the present time of this report, he has the honor of not having been linked to interdicts or any such documents that questioned his reputation either of church or politics, but he has constantly affirmed his right and his good name in both spheres. The narrative given here presents the brief services done by the subject of this account, and he knows and affirms its merits according to the judgment of the Bishop and of his other superiors after reading the quoted documents that have been added to his file. I certify that the preceding narrative agreed with the documents that the presenter has provided to confirm it, and I have the original in my possession. If you wish to send me a free-will offering for your online ADOBE copy, you are welcome to do so at this address where I will be until the end of May: Rev. Juan Romero c/o St. Joseph Church – PO BOX 1709 – Big Bear Lake, CA 92315. If you wish to have an autographed hard copy of the 2006 edition of book, please send to the above address your name and address together with a money order in the amount of eighteen dollars ($18) per book. Indicate to whom you wish the book(s) to be dedicated. RELUCANT DAWN is based on primary documents,in particular on the 1877 unpublished manuscript-Biography of Padre Martínez by Santiago Valdez, a close relative of the Padre. Valdez wrote it in Spanish, and Benjamin Read M. Read translated it into 19th century English. His younger brother Larkin Read, married to a relative of the Padre, beautifully copied the manuscript housed in the Ritch Collection at the Huntington Library near Los Angeles. The Mexican American Cultural Center in San Antonio (now called the Mexican American Catholic College) first published my monograph in 1976. I published a second edition in 2006 on the occasion of the unveiling of the Padre Martínez bronze memorial at the Taos Plaza entitled “LA HONRA DE SU PAIS/The Honor of His Homeland”for the epitaph on his tombstone. The phrase was coined by his peers in the Territorial Legislature on the occasion of the Padre’s death in 1867. I am pleased to make the text available, through this website dedicated to Padre Martínez, to anyone interested in the history and culture of New Mexico, especially to those with an interest in ecclesiastical history. Local iconoclasts in early 1993 maliciously torched the venerable east moradaof Abiquiú; about fifty miles northwest of Santa Fe, and then threw its santos under a culvert off Highway 84. That sacrilegious act horrified most Catholics and almost all of New Mexico’s people of good will. A morada is a sacred dwelling place used for the prayerful gatherings of the religious folk society Nuestro Padre Jesús Nazareno, better known as the Penitentes. The adobe morada that the vandals attacked, located on a hilltop a short distance east of the parish church of Santo Tomás, is considered one of the earliest ever constructed. The oral history of the brotherhood traces its beginnings at least to the early eighteenth century. Its membership in northern New Mexico and southern Colorado have for more than three centuries consistently maintained and promoted a deep devotion to the sacred passion of Our Lord. Abiquiú has been one of the focal points of the confraternity, and the hermanos have three distinct moradas in the vicinity of the church. rarily residing at nearby Ghost Ranch, about fifteen miles northwest from the morada, answered a call to help repair the damage. They came and carefully helped plaster the outside of the scorched church, enjarrando the charred adobe walls with a fresh coat of mud mixed with straw. Having recently arrived from Los Angeles at the Christ in the Desert Benedictine monastery in Abiquiú, I also helped the cause of restoring the damaged morada. The monastery is about thirty miles northwest of the village of Abiquiú. Almost half of the road, the more scenic part, has purposefully been left unpaved to promote the recluse nature of the monastery. The ecumenical cooperation of these Presbyterian youths would have horrified their religious ancestors, but would have immensely pleased Padre Antonio José Martínez, Cura de Taos, born in Abiquiú in 1793. As his tombstone recalls, Padre Martínez died in 1867, after serving the people “for forty-two years,” the last decade in sad disjunction from his bishop. For most of his ministry in Taos, Padre Martínez was moderator and spiritual father for the hermanos penitentes, and had a long-term and most important influence on their cofradías. Antonio José Martínez was baptized at the parish church of Santo Tomás on January 17, 1793—the feast day of Desert Father San Antonio Abad. This scion of the Martín Serrano clan was born at the Santa Rosa Plaza that had its own chapel a couples of miles east of Santo Tomás beside the Chama River where the family had their home. Fifteen miles or so northwest of Santo Tomas church on Highway 84, the majestic beauty of tall cliffs arise, layered in sandstone and sedimentary rock— yellow, brown, ochre, white, and pink. They framed the high desert landscape, over 6,000 feet that surrounded the young life of Antonio José until he was eleven when the family moved to Taos. Grandmothers tell tales about the brujas that inhabit the mystic scape enchanting many spiritual seekers who call Abiquiú and its environs their home. Among them are monks—Catholic Benedictines and Muslim followers residing at the Bar Al Islam Mosque—reclusive movie stars and artists bewitched by the fascination of the area’s spiritual aura. For centuries, Abiquiú has been a welcoming place for Native American hunters, genízaros (Hispanicized Indians), buffalo soldiers, and mid-nineteenth century trekkers on their way to Los Angeles or other destinations West. For reasons of internecine warfare or draught in the thirteenth century, emigrant Anasazi from the Mesa Verde area traversed east and then south along the Río Chama and the Río Grande to construct and inhabit pueblos. A pueblo on Potsiungue hill ([spelling?] no longer standing) along the Río Chama near Abiquiú was one of the early Indian settlements, and another (still vibrant) was the Ohkay Owingeh village (San Juan Pueblo) at the convergence of the rivers Chama and Rio Grande about six miles north of present day Española. The Taos Pueblo is at the northern extremity of the Reio Grande. Much before there were Native American or Spanish settlers in the area, there were dinosaurs in prehistoric days when the tectonic plates of Panama and New Mexico were embracing. The secret of why dinosaurs became extinct is revealed in the especially sticky mud of the Chama River. Among the great merits rightly credited to Padre Martinez was his contribution to the education and formation of adults and children. In the two decades from 1826 to1846, he founded an elementary school (1826), a seminary (1833) and law school (1846). He was also responsible for publishing on his printing press publications (broadsides, pamphlets, a newspaper and books) that covered religion, education, current events and politics. His greatest contributions, however, were to the religious and political life of New Mexico in its different incarnations under Spain, Mexico, and the United States. His impact upon the Penitent Brotherhood of Nuestro Padre Jesús Nazareno must be counted one of his greatest contributions to the spiritual legacy of the history of New Mexico. The literal extent to which these exhortations reached became manifested in the new world. Thirteen years after the Indian rebellion of 1680 and consequent expulsion of the Spanish colony, Don Diego de Vargas returned back to New Mexico with his soldiers, exiled settlers and companions from El Paso and territories further south. Also accompanying him were flagellants thoroughly imbued with the spirit and practice of the medieval societies that had deep devotion to the suffering Christ. A number of those accompanying De Vargas, including one of my own ancestors, Francisco Xavier Romero, settled in the area of Santa Cruz de La Cañada, not many miles to the east of present-day Española. It is not at all unlikely that some of these flagellants became the pioneers of what developed in an organization of Penitente Brotherhoods, and formed a hub for the practice and extension of the cofradías. Membership in the Hermandad consisted primarily of men, but there are tales of groups of women members, one in the Monte Vista area of southern Colorado, and the other in Arroyo Hondo, twelve miles north of Taos. The women of Colorado may still gather semi-formally to do corporal penance in a particular selected home, and the Arroyo Hondo women, La Sociedad de San Antonio, still meets at the Morada De Abajo. The small village of Arroyo Hondo with its two moradas—an upper and lower one— used to faithfully keep the feast of La Porciúncula on August 2, with the Vigil beginning in the evening of August 1. Fridays of Lent, Hermanos would often lead long processions for the public recitation of the Stations of the Cross. They sometimes led a procession, taking the large image of the suffering Christ, Nuestro Padre Jesús, from the church to the morada, and other times, they would be seen in flagellant processions on Friday nights of Lent. However, current activities of the Penitentes more frequently include leading rosaries at funerals and singing alabados. Members of the Hermandad, the Brotherhood, usually gathered on Wednesdays and Fridays for the purpose of prayer and acts of penance and to prepare for activities of Lent and Holy Week, the culmination of their year. Penitentes led the celebration for other important feasts such as All Saints and All Souls (November 1 and 2), and for the patron saint of the local village that was always especially noted. The more ample name of the Penitent Brotherhood is La Hermandad de Nuestro Padre Jesús Nazareno, an unwieldy but meaningful title. • La Hermandad (or Cofradía): People from Mexico sometimes refer to people from New Mexico as “’manitos.” This comes from the custom that older New Mexicans retain in referring to a neighbor or anyone else of the community as “Mano Fulano.” “Mano” here has nothing to do with “hand,” but is an apocopated from of “hermano.” Addressing one another as “brother” and “sister” is certainly of the Gospel, a vocative based in the New Testament and currently used mostly in churches and labor unions. Its traditional use in northern New Mexican society until the twentieth century may be a reflection of the historical strength of the hermandades or cofradias, i.e., the brotherhoods. Trying to discuss the mystery of the Blessed Trinity in human language is difficult, and in the early fourth century, Arius, the priest from Alexandria, got it wrong. He preferred to emphasize the biblical verse, “The Father is greater than I.” He heretically taught that the Son is not equal to the Father, but this is not orthodox theology as defined by Catholic Church teaching in ecumenical councils. The heresy of Arianism effectively denied the divinity of Christ, and was finally defeated with the Council of Nicea in 325. The spiritual descendants of Arius in the fourth century considered God the Father as the only true God, and did not accept that Jesus Christ fully shared in the divine nature. Arians asserted Jesus Christ had a beginning and therefore was a creature. They taught that Jesus, although exalted, was not equal to God the Father. They also denied that the Holy Spirit was equal to both the Father and the Son, thus demoting the Holy Spirit to a third tier of spiritual energy. Vincent Ferrer, a famous preacher, called for unity in Christ and his Church, and inveighed against the scandal of disunity promoted by rival claimants to the papacy: one in Avignon, France, and the other in Rome. The rift within high-level ecclesiastical politics disillusioned Vincent. He dedicated himself to preaching the need for repentance throughout various parts of Europe. He traveled with a team of priests and laypeople—men and women—and helped reconcile repentant sinners and catechized adults. Among those who followed Vincent Ferrer were flagellants who scourged themselves in a penitential discipline. Vincent “had inspired [them] to make public atonement… without degenerating into fanaticism.” The flagellants expressed a strain of Christianity modern for the twelfth century that strongly emphasized the humanity of Christ. It was a reaction to the first centuries of Christian devotion that focused on the source of salvation as the risen Lord, the Christos Kurios, the Lord and Messiah proclaimed in the early church and whose glorious visage was reflected in the splendiferous icons of the pantocrator, ruler of the universe. St. Francis of Assisi was the quintessential exponent of devotio moderna, “modern devotion” of the thirteenth and fourteenth centuries. Francis gave us the crèche and Stations of the Cross, and moreover manifested wounds of Christ’s passion on his own body—the stigmata. Francis helped the universal church of both the East and West to appreciate that the transcendent Lord of Hosts who became a little child and who, in full maturity, was yet touchable, reachable and passible, i.e., capable of human suffering and death. There were, in total, “seven leading founders of this new spirituality” that emphasized the humanity of Christ. During the Second Vatican Council that ended in 1963, the theological pendulum had reverted back to the ancient emphasis on the resurrected one: Jesus Christ the Lord. However, the experiences of believers and others oppressed in Latin America and Central America during the mid 1970s gave rise to a revived emphasis on the sufferings of Christ, His sacred passion and death. This was the reality to which they could more easily relate. Either the cross or resurrection by itself is incomplete. For salvation, both are necessary, and the complete paschal journey is through the cross to glory. Jesus Christ “had to suffer and die” before rising. We are called to the same paschal journey. • Jesús Nazareno: The name Jesus was common enough in the first century of the Common Era. It means savior, and contains within itself a proclamation of faith in Jesus as savior of the world. “By his stripes, we are healed,” the prophet Isaiah spoke in prophetic vision about the Suffering Servant some seven centuries before Jesus was born. One of the bultos of Jesus venerated by New Mexicans and other peoples of Latin America is the wooden and gesso image of Jesus standing in a red or purple robe, hands tied, and crown of thorns piercing his bloody head. This image is referred to as Jesús Nazareno or simply El Nazareno. In Hispanic Catholic iconography, the title evokes the bloody image of the Suffering Servant. An Advent prophecy speaks of Jesus as a Nazarene: “But a shoot shall sprout from the stump of Jesse, and from his roots a bud shall blossom.” The messiah’s birth is to be from the root, stem, or stump of Jesse, the father of King David. The Hebrew word for root or stem is natzer, and some scholars see the attribution of Jesus as a “Nazarene” from this derivation as well as from the fact that Jesus grew up in Nazareth of Galilee, his boyhood home until young adulthood. In his 1828 report, A Look At [Una Ojeada] New Mexico, Licenciado Antonio Barreiro, a Mexican layman and tax assessor responsible to the secular authority, painted a grim picture of the “doleful” financial situation of “the New Mexico” (La [Custodia] de Nuevo México). He gave it faint prospects for future potential revenue. He also painted a similar picture regarding New Mexico’s spiritual situation for the Cathedral Chapter of Durango, influencial in the process for the selection of the bishop to succeed Bishop Castañiza after his death. After the death of Bishop Castañiza, who had ordained Padre Martinez, Rome in 1831 appointed Don José Antonio Laureano de Zubiría y Escalante to succeed as the new bishop of Durango. Bishop Zubiría appointed Don Juan Rafael Rascón as Visitor General and Vicar of New Mexico, and sent him to reconnoiter the northern extremity of the Diocese of Durango in preparation for a futue visit of the new Bishop to Santa Fe and Taos. Padre Martínez sent a couple of his parishioners from Taos to Santa Fe in order to meet with Vicar Rascón during his visitation. One of the delegates of Padre Martínez was Donaciano Vigil, later to have a very significant role in the history of New Mexico. The purpose of the delegation was to speak with Vicar Rascón in the name of sixty hermanos of the Third Order of San Francisco. They asked permission to fulfill their observances in Taos instead of at the headquarters of “The Third Order” in the Vila of Santa Cruz de La Cañada. These sixty “brothers” from Taos were most likely members of Los Hermanos Penitentes. Vicar Rascón had no objection that these Taoseños fulfill their religious duties as Third Order Franciscans at Taos instead of at Santa Cruz, but honoring proper jurisdiction, he referred the matter to the Superior of the Franciscan Order in New Mexico. Padre Martinez, however, may have wanted something other than a convenience for his parishioners to fulfill a spiritual obligation closer to home. He seems to have coveted the role of spiritual leader in Taos of La Orden Tercera de Penitencia, the venerable and ecclesiastically approved religious society for lay faithful. The existence of the Franciscan Third Order in La Villa de Santa Cruz was as old as the settlement itself that dated to 1693. The Franciscan Custos, Guardian of the Province of St. Paul for New Mexico, was the superior of the secular Third Order for lay people. He was the one officially capable of delegating Padre Martinez to be the spiritual leader of the members of La Orden Tercera de Penitencia in the Taos area. During the time that I have had in my charge the spiritual administration of this parish, there has been a gathering of men belonging to the Brotherhood of the Blood of Christ who have been carrying on penitential exercises during Lent. They do this especially on the Fridays of Lent and during all of Holy Week from Good Friday until Pentecost, and on other such meaningful days of the year. Their exercises consist in dragging large wooden crosses along the ground, in whipping themselves with scourges that they have for this purpose, and in piercing their backs with sharp rocks or blades of volcanic glass until blood spurts out. There are other forms of penitential exercises prescribed this way: walk barefoot, even in the snow and ice, and go without clothes except for loincloths or white pants over their private parts and a mask-neckerchief over the face so as not to be recognized but still able to see…. Moreover, they have the custom of walking in procession in front of the sacred images on the days of Holy Week. They say that this is the way allowed to them since time immemorial. Nevertheless, for now I have suspended them from public manifestations. Since the manner in which they have carried out their rituals until now seems to me to be out of harmony [muy disonante]. I have permitted them to carry out their penitential exercises only at night or in solitary locations during the day. In the proportion that their number has grown, discord has also come about among them, and other followers are scandalized. In all, I am consulting your Excellency about what I should tell them in this case: continue their practices, modify them or take them away. For all that is said, I beg Your Excellency to please give me your response as to what I should do in this case. The indiscrete devotion of Penances that these Brothers or congregants, named for the Blood of Christ, cannot but excite one with a great disturbance of body and soul. In virtue of this, I heartily approve of what your words provide in order to suspend such excesses of public Penances. Hold fast to that prohibition, and call upon the help of the secular authority if necessary. With the pressure of things upon me, it seems more certain that I will not be able to see to it myself for now…. Meanwhile, would you privately exhort them to contain their Penitential practices within the privacy of the church–taking care to always carry them out with moderation. If they wish to placate divine justice and give pleasure to God as should be their desire, the best way to please Him ideally is to listen to the voice of their pastors and follow it with docility. In regards to the request about establishing a Third Order in that parish, we will talk about it upon my visit, and that will not be long in coming. The Bishop seemed to leave a certain opening to the activities of the Brotherhood by stating that prayer gatherings for moderate penitential exercises could be held in the church. However, Bishop Zubiría felt obliged to close the door to flagellant abuses that “at one time made Holy Church shed tears.” Forbiding any priest of the Territory from officiating in any place for Penitentes, the Bishop annulled the Brotherhood of Penance and said it ought to remain extinguished. He exhorted everyone to most punctually obey his decision, reminding all that obedience was one of the most acceptable sacrifices offered to God. Bishop Zubiría remained in New Mexico until mid-October. Before returning to Durango, he wrote another letter, this one on the Sacrament of Penance. Although he did not forbid moderate penance, calling it healthful for the spirit, he forbade the use of the large wooden crosses, asked that instruments of mortification not be kept in the church, and referred to certain practices as butchery (carnecería). nciscan Third Order had existed in New Mexico for almost a century and a half. At the behest of Bishop Zubiría, Fray Manuel Antonio García del Valle, OFM–as the superior of the Third Order in New Mexico and the Franciscan Custodian of the New Mexico Province of the Conversion of St. Paul—made the appointment official at the end of July. Padre Martinez was now the director of the venerable Orden de Terceras de Penitencia in Northern NM, and Fray Garcia del Valle entrusted the Padre “with power as full as that which we exercise.” This enabled bringing the Penitentes under the general umbrella of the Franciscan Third Order. Within the folds of the habit of the secular Franciscan Third Order, it seems to me, Padre Martinez re-configured the Hermanos of Nuestro Padre Jesus Nazareno and its practices in order to protect them from the effects of episcopal censure. In this way, the brothers not only survived but also flourished as an important and viable force of mutual help and religious devotion within the isolated and rural communitarian structure of New Mexico. Padre Martinez helped the brotherhood to maintain and deepen cultural and religious ties among the local community and beyond. He was a moderating influence, a spiritual father and guide, promoter, as well as organizer of the Penitent Brotherhood. Although layman Bernardo Abeyta, founder of the Santuario of Chimayó, was the “kingpin of nearly all the Brotherhood activity until 1855, “from Conejos area to Cochití for sure,” Padre Martinez was the one mainly responsible for molding the organization into its modern form. His role in the formation of the Penitentes’ organization–its practice and development –was influenced by the landscape of Abiquiú and Taos that imbued his boyhood, the religious heritage he personified, the circumstances of his own life and the developing history of New Mexico as it adapted to New Mexico’s changing history that Padre Martinez also helped shape. Many moradas, “dwelling places” where Penitente devotions and activities took place, existed in the Taos area during the 19th century, and an significant cluster continues today around the Taos area: Arroyo Seco, Ranchos, and Talpa. By 1827, six years after Mexican Independence from Spain and shortly after Padre Martinez arrived as the priest-in-charge of Taos where he had lived with his parents since boyhood, thirty or so families were living in the new plaza at Río Chiquito, a tributary of the Río de las Trampas in the vicinity of Ranchos de Taos. The village today is called Talpa after Our Lady of Talpa venerated especially in the sourthern mountainous region of Jalisco. Don Bernardo Durán, one of the more prosperous citizens of Río Chiquito, petitioned Padre Martinez on behalf of the families for the right to recognize the Virgin Mary as their special patroness under the title of Our Lady of San Juan (Bautista) de Los Lagos, venerated in the northern part of Jalisco. The following year, Bernardo Durán built the chapel of San Juan d Los Lagos. On the occasion of his 1833 visit to the area, Bishop José Antonio Laureano de Zubiría gave permission to have Mass and other liturgical services at the chapel of San Juan. own expense next to his own home, and very near to the chapel of San Juan. 40 A decade after the San Juan de Los Lagos chapel was built, Sandoval in 1838 established nearby his private chapel in honor of Our Lady of the Rosary of Talpa. The northern New Mexico small chapel, named for the Mexican shrine in southern Jalisco, signaled lively commerce on La Caravana from Mexico City through Chihuahua to Taos. On July 1, 1851, Lamy wrote to the clergy of New Mexico and announced his impending arrival. The roof of the Talpa Chapel was being re-roofed at the exact time that Jean Baptiste Lamy was arriving at Santa Fe as the new Vicar Apostolic and soon-to-be first Bishop of Santa Fe. Painted anew, dated July 2, 1851, an inscription on a plank (latilla) of the new ceiling announced that the chapel was for the “use of [a la dispocición de…] the priest Don Antonio José Martínez.” The person who helped refurbish the church and painted the plank signed his name as José Samora. The last name is not common in New Mexico. A person by the same name was the “President or Elder Brother (Hermano Mayor) and Councilman José Francisco Zamora” in 1857, and he may be the same person. Although Padre Martinez initially tried to ingratiate himself with the new ecclesiastical authority, upon request lending his counsel in canonical matters and making a financial loan, the relationship never warmed. Almost from the start, Lamy was in tension with the powerful Padre Martinez of Taos. Within a year of his arrival, the new Bishop re-imposed a system of tithing that Padre Martinez—as a young priest—had helped terminate. Martinez had claimed it was an excessive burden on the poor, but Lamy, within a couple of years of his arrival, threatened to bar from the sacrament of Eucharist those who did not comply. In the newspaper La Gaceta de Santa Fe, Padre Martínez publicly denounced his Bishop for simony and hucksterism because of his insistence on tithing under pain of censure. Padre Martinez later tried to take back some of his intemperate public statements and, in other correspondence, told Bishop Lamy he was thinking of retiring because of health concerns. Because of an illness, Padre Martinez returned home to Taos in early 1822 shortly after ordination, but before finishing some course. That lack impeded his becoming officially named a pastor, although he was in charge of various parishes, he went back to Durango where he had studied as a seminarian for a year’s sabbatical in 1840. Finally, after many years, Padre Martínez was canonically named an “irremovable pastor,” CURA PROPRIO of the parish of Nuestra Señora de Guadalupe in Taos where he had grown up as a young man and where he had been serving as priest-in-charge (interim pastor) since 1826. Now, according to the canon law of the time, Padre Martínez could not be removed from his parish except for grave cause and only after formally requesting a transfer in a letter. to denounce Padre Martinez for celebrating Mass at the Chapel of Our Lady of Talpa. Father Taladrid apparently drafted series of Twelve Rules for the Penitentes in order to attempt to exert control over the Brotherhood, or at least codify their norms for easier reference by the Bishop or his surrogates. He urged Padre Martinez to relinquish his spiritual authority over the Third Order Lay Franciscans, but Padre Martinez of course demurred, saying he could not give up his sub-delegation of authority over the Third Order since it was given to him personally. On October 27, 1856, Bishop Lamy promulgated the Twelve Rules for the Penitentes and on the same day, officially suspended Padre Martínez from performing his priestly functions: celebrating Masses, hearing Confessions, and preaching. Father Eulogio Ortiz, now the Bishop’s secretary, succeeded Father Taladrid as the priest in charge of Our Lady of Guadalupe parish in Taos. In the spring of 1857, “His Grace Don Juan Lamy graciously granted permission to continue the devotion [my emphasis] of the Passion and death of Our Lord, Jesus Christ, as a penance, by all the devotees.” On March 9, 1857, the Bishop promulgated an additional Five Rules for Penitentes, a complement to the Twelve Rules that “[Father] Taladrid himself had formulated for the Brotherhood.” The promulgation of rules for Penitentes—Five Rules drafted by Father Ortiz in addition to the Twleve Rules presented by Father Taladrid—clearly showed that Bishop Lamy recognized the existence of the Brotherhoods and approved of them to the extent their members follow the rules. The 9th and 10th rules specifically require that all members of the Brotherhood obey and respect Bishop Lamy and their legitimate parish priest. The rules expressly permitted the Brothers to do penance, as has been their custom for many years back, with these provisos: that the penance be hidden, that it does not give scandal to the rest of the faithful, and is not done with excessive pride. These concerns echo the Special Letter that Bishop Zubiría had written for the Penitentes in 1833, but without any condemnation attached. The treatment of Penitentes under Bishop Lamy, it must be said, was happily more moderate and pastorally more sensitive to the popular religion of New Mexicans than either that of his Mexican episcopal predecessor Zubiría or fellow Frenchman and successor Bishop Jean Baptiste Salpointe. Father Taladrid under a cloud, left the pastorate of Guadalupe Church in Taos. Padre Martinez was hoping that Padre Medina, one of his seminary students, would eventually become the pastor of Our Lady of Guadalupe, but Bishop Lamy sent Father José Eulogio Ortiz in 1857 to replace Taladrid as pastor. Padre Martinez was at first pleased to welcome Ortiz, a native New Mexican and one of his alumni in the pre-theology seminary. Young Father Eulogio Ortiz was also the nephew of former Vicar Padre Juan Felipe Ortiz. However, as a young priest, Father Eulogio had accompanied Bishop Lamy on one of his trips to Rome, was a favorite of the Bishop, and not at all sympathetic to Martínez. Padre Martinez may have invited ecclesiastical censure for publicly denouncing his Bishop in the press, accusing him of simony: exacting tithes under pain of exclusion from Holy Communion for those who did not comply. He may also have invited censure for presiding at the marriage of his favorite niece to Pedro Sánchez in his newly built private oratorio after Father Taladrid had refused permission for Martinez to officiate at the wedding in the parish church. There were rumors, but no proof of unbecoming or illicit moral behavior, asserted Vicar General J.P. Machebeuf, although the Padre did sire children. Nevertheless, Padre Martínez was not prepared for the most severe censure of excommunication thon the heels of a tiff with Father Eulogio Ortiz regarding accutrements from the Chapel of Our Lady of Talpa during Holy Week of 1858. Father Eulogio Ortiz, the new pastor of Our Lady of Guadalupe church in Taos, surreptitiously took from the Chapel of Our Lady of Talpa some Penitente-related images. Padre Martínez became irate and, expecting just recourse, passionately reported the incident to Bishop Lamy. Instead of recriminating Father Ortiz, within two weeks after the Talpa Chapel altercation with Father J. Eulogio Ortiz, Bishop Lamy excommunicated Padre Martinez on Low Sunday, the Sunday after Easter! Manifest Destiny provided a providential opportunity for Protestants to evangelize the “perverted” Hispanic Catholicism of the Penitentes and of all people in the Southwest. “Calvinism—ministers of the Congregationalist, Presbyterian, Baptist religions and others of that ilk—had a horror of ritual in the 19th century, but Congregationalists and Presbyterians eased up in the 20th century,” observed Father Steele. Their missionaries published descriptions of the Penitentes as a part of their missionary strategy to demonstrate the importance of their task and to describe challenges and hardships they faced. Their sentiment was that these neo-pagans of Spanish Catholic ancestry need a conversion to the real Jesus. Their descriptions of bloody rituals and practices were calculated to elicit horror from Eastern Protestants who would then become more disposed to support their missionary efforts with funds and personnel. ized in about 100 congregations in New Mexico and southern Colorado. Several family members and others close to Padre Martínez became Presbyterians, including Pascual Martínez, the Padre’s youngest and favorite brother. Pedro Sánchez, whom Padre Martinez married to his niece in his own oratorio, flirted with Presbyterianism in the 1860s, but was later reconciled to the Church during some missions the Jesuits under the leadership of Father Donato Gasparri gave in the Taos area after Padre Martínez died in 1867. Almost forty years later, in 1904, Sánchez authored his panegyric Memorias Sobre La Vida del Presbítero Antonio José Martínez, Cura de Taos wherein he makes no mention of church controversies. José Domingo Mondragón is reputed to have been an Hermano Mayor of the Ranchos de Taos area. He and Vicente Romero became elders of the first Presbyterian Church in Taos in 1873, located across the road from the residence of Padre Martínez and later at El Prado adjacent to the Taos Pueblo. Mondragón was a candidate for ministry by 1877 and obtained his licentiate in theology by 1878. He held the church title of Evangelist and served in Taos and Ranchos de Taos from 1880 to 1895, spending 1884 in Mora—about seventy miles away. José Vicente Ferrer Romero, also a lay evangelist, was an illegitimate son Padre Martínez, born in Taos of the widow Teodora Romero only two years before the American occupation in 1846. It was a highly conflictive time both in civil society and in the church of Santa Fe. Until his death in 1912, at the age of 68, Vicente Ferrer Romero served as an active and effective lay evangelizer for the Presbyterian Church in northern New Mexico. The whole series of events left a wound in the side of the Catholic Church in New Mexico that was long to heal, and the scar can yet be felt. To the Spanish-American minority, however, the wholesale removal of the native clergy has been a tragedy, for it deprived them of their natural leaders capable of cushioning the shock of conquest from which as a group the Hispanos have never quite recovered. Reyes N. Martínez of Arroyo Hondo told a story claiming that a Penitente going to the calvario at the upper morada in Arroyo Hondo dropped to his knees, jolted the carriage with Doña Sebastiana inside, and “released the arrow that pierced his kidney and killed him.” Mi Comadre Doña Sebastiana rides the Death Cart, a wooden carving dear to the Penitentes and many older northern New Mexicans. Death comes “in the wink of an eye”—accoridng to a popular Latin saying pertaining to death, part of Catolic culture for centuries. We are also exhorted to remember death because “time flies.” The figure represents Death, not as a macabre reality, but as St. Francis would have it, “Sister Death.” She is comadre, i.e., a member of everyone’s family. The family treats her with respect, calling her Doña. She is named after St. Sebastian, a post-logical allusion to the third-century Roman saint who was martyred with arrows. This is supposed to have taken place in 1867, the year of Padre Martínez’ death. Maybe it is a metaphor of the dying of a people that took place along with its leader. However, even with—and maybe especially among—Penitentes, there is hope of resurrection. The esteem in which Padre Martinez was held by the villages of Taos, and particularly by the Penitente Brothers, is attested by the fact that upon his death—after a Vigil of thirty-six hours–more than 300 members of La Fraternidad Piadosa de Condado de Taos and other Hermanos from all over northern New Mexico marched in his funeral procession. “Never” is long time, and the “never” that E. K. Francis talked about may be near. The healing process is slow, but full recovery of the enlightenment brought to New Mexico is once again on the horizon of this reluctant dawn because of the renewed interest in Padre Martínez and a greater appreciation of his rightful place in the history of New Mexico and the Catholic Church. Images of a patron saint or sacred theme crafted by a santero, either traditionally painted with vegteble dyes on wood or carved from a piece of wood. Literally translates to Our Father Jesus the Nazarene, a folk brotherhood in northern New Mexico with great devotion to the passion of Jesus Christ. The Penitentes are a lay religious franternal organization, a “brotherhood” or cofradía. The adobe churches of New Mexico are made of “living stones,” i.e. dried mud bonded by straw. It is mixed by hand, and renewed by massaging (plasterning) new wet med and straw for renewal and repair. The communal process is called ejarrar. A brotherhood or fraternal organization with charitable or religious purposes whose membership meet from time to time to carry out their purposes. A witch in Hispanic mythology is a woman with spiritual power, for good or evil. Most witches in New Meican folklore are benevolent, e.g. Ultima of Rudolfo Anaya’s 1972 novel Bless Me, Ultima recently made into a film. Native American tribes gave this nickname to African American soldiers of the 10th Army Regiment of the U.S. Army, formed at Fort Levenworth in 1866. Several of these retired soldiers settled in the Abiquiu Area. My uncle Tomás Romero researched the patriarchal family tree by from documents handed down in the family. The area of Santa Cruz de La Cañada was a stronghold of Penitente activity. By 1739, Santa Cruz was a point of departure for migration westward to Abiquiú and Tierra Amarilla, and by 1775 northward to Taos and into southern Colorado. This is a very Franciscan feast in honor of Our Lady Queen of Angeles who is honored at a basilica built at Assisi in the seventeenth century. The basilica was constructed by devotees of the Povorello, St. Francis, who in the thirteenth century used to pray at a Benedictine-built wayside chapel at Assisi. After Francis gathered followers, they used to meet there, and he died there (his transitus) on October 3, 1226. The small chapel within the large basilica came to be called Porciúcula or little portion. Hymns of praise whose tone modality was often doleful, frequently sung at the Rosary vigil the evening before funerals. Weigle, p. 214. Appendix XII – Archbishop Salpointe’s Circular on the Penitentes, English Version – February 7, 1892. Catholic Encyclopedia, Vol. 14, p. 681, Catholic University of America, Washington, D. C., c. 1967. Steele, S.J., Rev. Thomas, “Late Medieval Spirituality” in Alabados of NM, pp. 81-17, especially pp. 81-10. The other six besides St. Francis of Assisi (d. 1226) were the following: saints Romuald (d. 1027), Bernard (d. 1153), Dominic (1221), and Bridget of Sweden (d. 1153). Numbered among the top three “for New Mexican purposes,” besides St. Francis, were Peter Damian (d. 1072) and Anselm of Canterbury (d. 1109). The Cathedral Chapter is responsible for any important decisions that must be made before the selection of a succeeding bishop. Donaciano Vigil succeeded Charles Bent as Governor of New Mexico after his assassination. Vigil most prominently severed as the second Governor of New Mexico under military rule. In February 1847, he convoked a Territorial Convention that met on October 14, and it selected Padre Martinez as the President of this Convention for the establishment of a government “purely civil in character.” Cf. Benjamin Read, Illustrated History of New Mexico, Santa Fe, 1912, pp. 453-54; pp. 439, 456, 461, 539, and 608. “The Third Order of Penitence of Our Holy Father St. Francis has existed, although the exact year for is not fixed, since just about the [time of the] re-conquest of the Province [in 1693].” Weigle, op. cit., p. 197, Appendix III, Report of Rev. Custos Fray Cayetano José Bernal to Governor Fernando Chacón, October 1794. Letter from Padre Martínez to Bishop Zubiría, February 21, 1833. Mary Taylor, an amateur and competente historian, El Paso residident whose husband Paul served in the NM House of Representatives, unearthed the significant letter in the Archives of the Cathedral of Durango, Mexico. She copied and sent it to William Wroth who quoted it in his Images of Penance, Images of Mercy: Southwestern Santos in the Late Nineteenth Century, Taylor Museum, published for Colorado Springs Fine Arts Center by University of Oklahoma Press, c. 1991. Translation of Spanish text of the letter is mine, Appendix 1, p.172. Wroth, op. cit., Appendix II, p.173, from the Archives of the Cathedral of Durango – Microfilm roll 16, frame 689. Bishop Zubiría’s Pastoral Letter of July 21, 1833 to priest and people of Santa Cruz de La Cañada quoted in Weigle, Appendix I – pp. 195-96. The letter was also intended for clergy and laymen wherever Penitentes were found. Spanish transcribed by Marta Weigle from the Microfilm Edition of the Archives of the Archdiocese of Santa Fe, NM State Records Center and Archives, Roll 50, Frames 0147-0149. Books of Patents, No. 73, Box 7, described by Chávez, Archives of the Archdiocese, p. 156. English translation mine. Weigle, op. cit., p. 29, and p. 234, footnote #38. Flagellant sects emerged two different times in Europe, and were powerful and schismatic enough to provoke Church denunciation. The first time they emerged was in Italy following the Black Plague in 1260, and the second time was in Germany during the fourteenth century. The Council of Constance in 1417 decreed against them. Public flagellations were not common until the end of the fourteenth century (1580s) when the apocalyptic preaching of St. Vincent Ferrer contributed to their rise in cities such as Valencia…and Seville. Bishop Zubiría, October 19, 1833, quoted in Weigle, p. 196. Father Steel notes that, “In Taos County, women need not apply.” However, there is a tradition that women at Arroyo Hondo were involved in penitential practices and devotions at the Lower Morada dedicated to the honor of San Antonio. Library, San Marino; unpublished manuscript, English version by Juan Romero, prepared 1993, p. 45. Bernardo Abeyta’s son attended the minor seminary of Padre Martinez in Taos, and was ordained a priest. Notation of Fr. Tom Steele, S.J. on essay. Albert López Pulido, Sacred World of the Penitentes, Smithsonian Institution Press, Washington, 2000, p. 92, n.30 summarizes the argument Wroth makes in Images of Penance, pp 51-52. William Wroth, The Chapel of Our Lady of Talpa, The Tayor Museum of Fine Arts, Colorado Springs, 30 West Dale Street, Colorado Springs, Colo. 80903, 1979, p. 24.
in the 1830’s. Margarita’s grandmother was Juana María Sandoval, the daughter of Nicolas. Juana María married Francisco Duran for whom the chapel came to be known. The Talpa chapel was the one Padre Martinez used mostly after his estrangement from Bishop Lamy in 1858. A U.S. census taker in 1860 referred to it as a “schismatic church,” but Fray Angelico Chavez roundly repudiated that term as appropriately describing the reality. Cf. Fray Angelico Chavez, But Time and Chance, Sunstone Press, 1984, pp. 146-147. Since the mid 1960s, this chapel has existed only in the rubble and miniscule ruins of its foundation, hidden from view, located on private land near the highway. The adobe of the once stately chapel returned to the elements for lack of care. However, the chapel is the subject of one of the scholarly and informative publications of the Taylor Museum in Colorado Springs. A replica of its interior used to be prominently displayed there. May it someday be rebuilt as a house of prayer dedicated to the reconciliation of people who live in conflict. Weigle, op. cit., Appendix VII: Bishop Lamy’s Five Rules for the Penitente, March 9, 1857, p. 205. Father Steele noted on the draft of this manuscript, “Tithes and Frist Fruits—diezmos y primicias—are NOT the same as aranceles.” Bishop Lamy effectively cut the income of the native clergy by lowering the stole fees (aranceles) for baptisms, marriages, and burials. Father Steele suggests the “cuts were 66% to 75%…!” Bishop Lamy reinstated tithes and first fruits under the pain of an ecclesiastical censure that may have included exclusion from Christian burial. Letter of Padre Martinez to Bishop Lamy, Nov. 12, 1856. Fr. Philip Cassidy, native priest of the Archdiocese of Santa Fe, translated the letter in a manuscript her wrote in the late 1960s. Quoted in Juan Romero, Reluctant Dawn, Second Edition, 2006, The Taos Connection – Palm Springs, CA, p. 48. AASF (Archives of the Archdiocese of Santa Fe), L.D. 1856, No. 24. AASF, L.D. 1856, No. 33. Bishop Lamy may have wanted to ingratiate himself with the natural powerbase of Padre Martínez, the Hermanos Penitentes. “These serious seekers, by a false road for salvation [my emphasis: title of an article by Juan F. Martinez] have not been forgotten of God, ever on the watch for the sincere…” Alexander Darley, quoted in Juan Francisco Martinez of Fuller Seminary for CEHILA Discussion Paper-Draft, n.d., p. 10. Weigle, pp. 207-208, Archbishop Salpointe’s 1886 Circular on the Third Order of St. Francis. Father Damasio Taladrid was a serious drinker, had a difficult temperament, and did not get along with parishioners who retained their love for Padre Martinez. The mutual animosity between the priests Taladrid and Martinez lessened, and they were able to get along. Padre Marteinez kept asking for a native New Mexican as an assistant priest, and requested Padre Ramón Medina. However, Bishop Lamy eventjually did send a native New Mexican priest: Father Eulogio Ortiz, former student of the Padre and nephew of Vicar Juan Felipe Ortiz of Santa Fe. In addition, Father Ortiz enjoyed the confidence of the Bishop, having accompanied him to Rome on a visit, and later becoming his priest-secretary as well as preist-in-charge of Guadalupe parish. AASF, L.D. 1858, No. 17, quoted in Talpa Chapel, Ibid. p. 36. Padre Ortiz appeared before the District Court in Santa Fe, and this is documented in a letter written April 12, 1858 by Judge Kirby Benedict of the Federal District Judge for Taos and Santa Fe. (Ibid. p. 36) The Taos Brotherhood’s Constitution and own rules of February 23, 1861, drafted by Nicolás Sandoval and four others, was a clear attempt to protect the Brothers from any further attacks of this kind. “The Hermano Mayor may also apprehend any person who is not a member of the society and who ridicules, disturbs, or in any way hinders the spiritual exercises of the said fraternity. He may enter legal action against him before the civil authorities in the name of the Fraternity of the County of Taos.” Quoted in Ibid, pp. 36-37. I sent Father Steele a draft of this essay for his comments. This was one of the notations on the returned manuscript. Darley called Penitentes “serious seekers, by a false road, for salvation, have not been forgotten of God, ever on the watch for the sincere, even though ignorant and, therefore, false seeker for light…” Passionists, pp. 58-59, quoted in Juan Martínez. Juan Francisco Martinez, quoting Minutes of the General Assembly of the Presbyterian Church, USA (1877- 1900). Cf. Randi Jones Walker, Protestantism in the Sangre de Cristos: 1840s-1900s. AASF, L.D. 1858, No. 17, Troy, n.d. Ch. IV: 2-3 quoted in Ibid. p. 37. Brother of Cleofas Jarfamillo, author of Shadows of the Past, and author in his own right. He wrote several items for the Works Projects Administration during the 1930s. In ictu oculi – In the wink of an eye, i.e. quickly, unexpectedly. Tempus fugit, memento mori. = Time flies, remember death. Wroth, Talpa Chapel, p. 170. Weigle, op. cit., p. 49. This website is dedicated to the person and legacy of Padre Antonio Jose Martínez (1793-1867) who during his life was known as the Curade Taos (Priest of Taos). 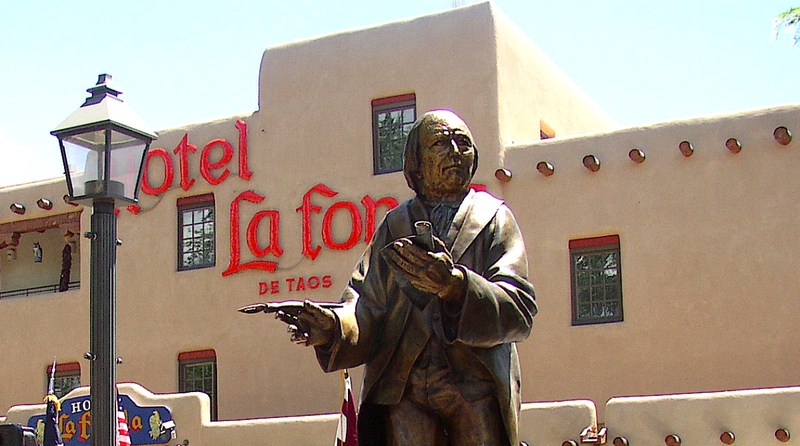 Upon his death in 1867, the NM Territorial Legislature called him La Honra de Su País (The Honor of His Homeland). He was orginally buried in his private chapel by his home in the center of Taos, and twenty-four years later his remains were removed to the “American Cemetery” on land that the Padre had donated for the burial of the Americans killed in the 1847 Uprising, located in what is now called Kit Carson Park. The encomium LA HONRA DE SU PAIS/THE HONOR OF HIS HOMELAND was inscribed on his upright gravestone as part of the epitaph. The NM State Legislature in 2004, under the leadership of Senator Carlos Cisneros, reprised that phrase in a unanimously passed resolution that provided funding for a public arts project. Two years later, that phrase became the title for the larger than life-sized bronze memorial of Padre Martinez sculpted by San Luis artist Huberto Maestas and erected in the Taos Plaza. Antonio José was born along the Chama River in Abiquiu, avillage established in 1739 west of Santa Cruz (next to Española) along the RioGrande. When he was eleven, in 1804, he moved to Taos together with his parentsand younger siblings. At nineteen,Antonio José married Maria de La Luz Martinez, a distant cousin. Within a year, his young wife died as shewas giving birth to their daughter who was named for her mother. The widower decided to study for the priesthood, left hisdaughter with her maternal grandparents, and made his way to the seminary inDurango where he excelled in his studies, especially canon (church) law andphilosophy. A major influence in his life was Padre Miguel Hidalgo, father ofthe Mexican nation. From his parish ofOur Lady of Sorrows and under the banner of Our Lady of Guadalupe, in 1810,Padre Hidalgo shouted for independence from Spain. Eleven years later, in 1821, a year before Antonio José wasordained a priest, Hidalgo’s shout for independence bore fruit. La Nueva España, including New Mexicoand all of what is today called the “southwest,” became La Republica deMéxico. Shortly after his ordination, Padre Martinez returned to hisnative home in Taos. He was supposed tohave stayed for another year in Durango to obtain some pastoral experience andcontinue his theological studies. However,he was sickly—asthma (? )—so he returned to live for awhile at his parents’ homewhere some of his younger siblings were still living. The young Padre Martinezhelped the aging Franciscan priest who was the pastor of San Geronimo (St.Jerome) parish, the main church of Taos founded at the Indian Pueblo at thedawn of the seventeenth century. PadreMartinez also helped with baptisms, funerals, and wedding preparation at thechurch of Our Lady of Guadalupe at the Taos Plaza, about three miles to thesouth. Guadalupe was not yet its ownparish, but was still a mission dependent on the main church of San Geronimo. After he recuperated from his illness, Padre Martinez wasassigned to a couple of parishes where he had the opportunity to show hisspecial love for the poor—at Tomé located south of Alburquerque and at theparish of Santo Tomás in Abiquiu where he had been baptized as an infant, andwhere his wife was buried and his daughter was living with hergrandparents. By 1825, the young Maríade La Luz also tragically died at the very young age of twelve, and within ayear, Padre Martinez was reassigned to be the priest in charge at Taos. This was his fondest hope, now realized. This blog will explore in some detail—through biography,correspondence and other documentation– the forty-two years that PadreMartinez spent in Taos from 1826 until his death in 1867. I warmly invite you to MARK THIS BLOG AS ONEOF YOUR FAVORITES. Beinteractive, and share what especially intrigues you with others who may beinterested. Please help get the wordout. Invite others to track this blog.